Georgetown Instrument Services is no longer certificated by the FAA. Please contact Castleberry Instruments & Avionics for all your instrument and avionics needs. You can find them at http://www.ciamfg.com. GIS was founded in Georgetown, Texas in early 2002, and received FAA certification in February, 2003. When GIS opened for business, there was the founder, Efrain Lopez and one other employee. Currently 11 technicians and office personnel efficiently service customer requirements. Plans to add up to 15 more technicians are not far in the future. GIS is dedicated to the customer well being and focuses to deliver its product to meet the challenge of exceeding customer expectations daily. “The goal from day one continues to improve our focus on customer service using updated technology,” said Efrain Lopez, GIS president. The company has invested in equipment and facilities offering the latest technology and efficient operations. Lopez got started in the field almost by accident, as a technician at one of the instrument repair shops in Austin. Starting in gyro repair, he moved on to customer service, and then outside sales which developed his expertise in all aspects of the business. Working his way up gave him a real hands on feel for the instrument repair business. Georgetown Instrument Services customer satisfaction is founded upon the principal of delivering exceptional and unequalled value to the customer. This value is derived from providing good turn times, flexibility to work well with customers and forming a lasting trust through unquestioned honesty. GIS attention is to customer detail, not on the competition unlike large facilities where that focus changes during troubled times. Lopez is proud of the family atmosphere he has fostered at GIS. It is reminiscent of what he found when he began in the aviation industry years ago. Our shop runs as a team effort. So what does Georgetown Instruments Services offer its customers? The answer is competitive prices, high-quality workmanship, reliability, and service. In addition, GIS personnel understand that quick turnaround time is more than important and better yet, they have the ability to meet that challenge. 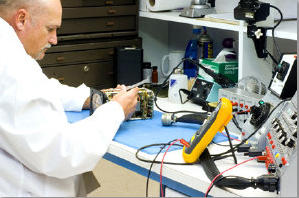 Georgetown Instrument Services goal is to exceed customer’s expectations. And they do, too. Every day.